If you’ve decided that bi-fold doors are for you, you need to first make sure you’re choosing the right ones. Ensure that your investment will not only be a beautiful addition to your home, but one that is fit for the future. Depending on the size of the opening you’re looking to fill, you’ll need to think about how many panels you'll want to install for your bifold doors. The options are generally two to six panels, however two panels is a relatively rare occurrence. Two and three panel doors will concertina to one side, while four door set ups usually have one panel folding to one side and three to the other. Five door configurations will usually all concertina to one side, and for six door configurations there is the option of one panel one side and five the other, or three and three. When choosing your panels it’s important to consider what your room will be used for, and the amount of space available to accommodate your doors. A larger panel width will mean more room is necessary for their use. 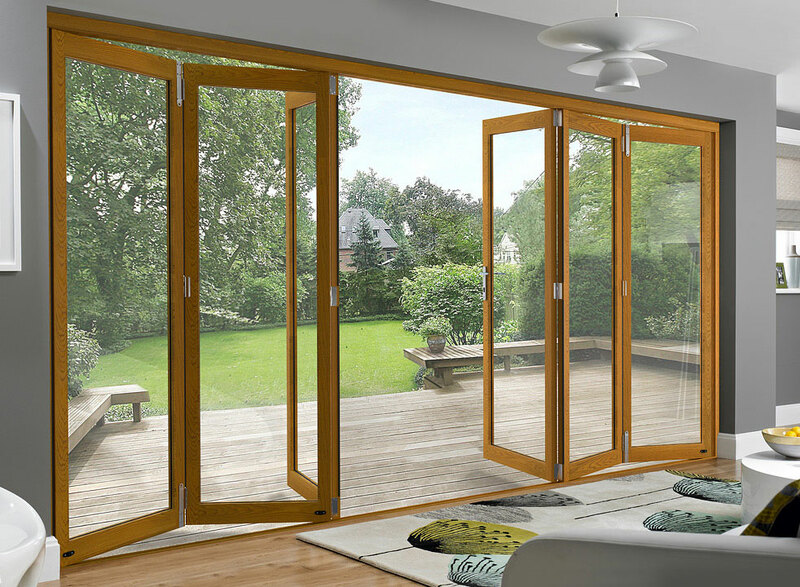 The standard option for bi-fold door frames has traditionally been uPVC, however this has fallen out of fashion as people look for more natural options, like timber or aluminium. Timber doors come in many different varieties, and can really make a home look beautiful. While hardwood is a durable and high quality option, it may be too expensive for some. Softwood is a cheaper alternative, however it is important to be aware that some of the lower-end models will, when exposed to the environment, be prone to warping over time, which means that their frames may stick or refuse to close. If you’re looking to invest in high quality bi-fold doors, hardwood is certainly an option, however aluminium also has its advantages. Due to its strength, aluminium allows for slimmer frames, which can create a sleeker appearance. Not only this, but a powder-coated finish means it will never have to be re-coated. A way to be a friend to both your bank account and the environment, energy efficiency is an ever growing concern with homeowners. Building regulations dictate the total energy efficiency of a property - which, of course, would include your bi-fold doors. UK building standards require that all external doors must have a U-value of 1.8w/m2k or lower. Another thing to consider would be how weather proof your doors are. Ensure you’re going for frames with a strong seal that can keep out the wind and rain. Your budget for your bi-fold doors will be heavily based on what quality of materials and installation you choose to go for. However, as a general rule, you could expect to pay roughly £1,200 per linear metre of overall frame width. This will be for a good-quality, well-engineered system. Don’t forget that on top of the materials, there will be costs for installation, VAT, and possibly delivery. Because of this, a three panel door might cost anywhere between £4,000-£5,000.